Blessed art Thou, O Almighty Master, Who has enlightened the day with the light of the sun and has illumined the night by the rays of fire, Who has deemed us worthy to pass through the length of the day and draw nigh to the beginning of the night. Hearken unto our supplication, and that of all Thy people. Forgive all of us our sins, voluntary and involuntary, accept our evening entreaties, and send down the multitude of Thy mercy and compassion upon Thine inheritance. Encompass us with Thy holy Angels; arm us with the armor of Thy righteousness; surround us with Thy Truth; protect us by Thy Might; deliver us from every grievous circumstance and from every conspiracy of the Adversary. And grant unto us that this evening together with the coming night and all the days of our life may be perfect, holy, peaceful, sinless, without stumbling and vain imaginings; by the intercessions of the holy Theotokos and of all the Saints who, from ages past, have been well-pleasing unto Thee. Amen. On May 2nd Our Holy Orthodox Christian Church commemorates, honors and entreats the holy intercessions of the following Saints, Forefathers, Fathers, Patriarchs, Prophets, Apostles, Preachers, Evangelists, Martyrs, Confessors, Ascetics, Teachers and of every righteous soul perfected in Our Holy Orthodox Christian faith: The Translation of the Holy Relics of Our Father Among the Saints Athanasius the Great; Saints Hesperus, Zoe, and their sons Cyriakos and Theodulos, at Attalia; Saint Athanasios III, Patriarch of Constantinople; Saint Boris-Michael, king of Bulgaria; Saint Athanasius of Syandem and Valaam; Saint Jordan the Wonderworker (Miracle-worker); Translation of the holy relics of Holy Passion-bearers Boris and Gleb of Russia. +By the holy intercessions of Your Saints, Holy Martyrs, Holy Ascetics, Holy Mothers, Holy Patriarchs, Holy kings, Holy Wonderworkers, O Christ Our God, have mercy on us and save us. Amen. 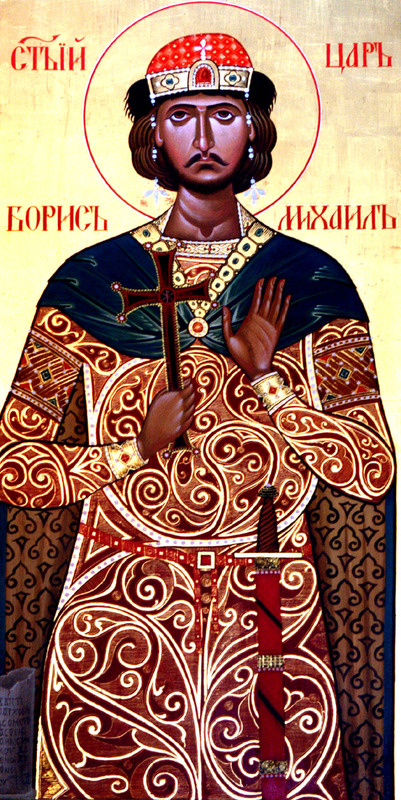 SAINT BORIS-MICHAEL, KING OF BULGARIA. Saint Michael, known as Boris in his pre-Christian days, was brought up a pagan. His uncle and sister converted him, and he was baptized taking the name of Michael. Since Michael was king, Patriarch Photios of Constantinople sent him priests, and in time, all of Bulgaria was Christian. The disciples of Sts. Cyril and Methodius, the two Greek missionaries to the Slavs, were especially helpful in these conversions. In old age, St. Michael decided to become a monk, and appointed his son Vladimir as his replacement. When news of his son's persecution of Christians reached St. Michael, he temporarily changed his monastic habit for his old military garb and deposed his son in favor of a younger child, Simeon. Saint Michael ended his life peacefully in asceticism. Having planted the dogmas of Orthodoxy, thou didst cut out the thorns of false doctrine; and with the rain of the Spirit, thou didst increase the seed of the Faith. Wherefore, we praise thee, O righteous Athanasius. We continue where we left off on "Secularism in the Church" by His Eminence Metropolitan Hierotheos of Nafpaktos. Further, the Church is secularized when it is viewed as an ideological field and an ideological system, unrelated to life. Ideological systems are inspired by abstract ideas and are imbued with idealism, which has the characteristics of all anthropocentric systems that are based on philosophy and are against materialism. Ideas do not have much of a relation to life, to man's transformation. Idealism is created by man's rationality and is presented in the form of arguments and ideas. The Church does not function as an ideological field. It does not simply have some ideas, be it the best and most perfect ones, which it uses to counter other ideas. The Church has the life, indeed the true life, which is a fruit of man's communion with God and transcendence of death. The secularized Church is occupied with human thought and abstract ideas. The real and true Church, however, is like true medicine, and in particular surgery. A surgeon can never engage in philosophy and culture, can never meditate while performing a surgical operation. In front of him he has a patient he wants to cure, to bring back to full health. Likewise the Church, having in front of her a patient, can never meditate or philosophize. The Church itself experiences the mystery of Christ's Cross and assists man in experiencing the same in his personal life. The experience of the Cross mystery is the deepest repentance through which the nous is transformed. From the contrary-to-nature motion it acquires movement according to nature and above nature. Furthermore, the Church becomes secular when it is downgraded to a social organization, like so many other organizations in society. But the Church cannot be considered the institution of any nation, even its supreme institution. When a revolution ends up in a bureaucracy, it loses its value, and this brings about its downfall. The same is true of the Church. Being the spiritual hospital that cures man, the Church cannot be considered an institution in support of society, appropriate for citizen taming. Unfortunately, today some view the Church as a necessary organization, useful to society, its role valued according to its social usefulness. For many the Church is viewed as Prometheus, with police in the role of Epimetheus; that is, the Church is good enough as society's assistant in order to avoid police intervention. When the Church fails, the police step in. Certainly one cannot dismiss Church benefaction in such matters. A cured Christian causes no troubles to the police. But we should not see the Church presence only in this field because then we refer to a secularized Church. Others, unfortunately, accept the Church as a mere decorative element. They need it to decorate various ceremonies and to brighten them with its presence; or they may believe that the Church's presence is required to demonstrate a wide social consensus. Not even the atheists reject such a church. However, such a secularized church causes despair to the atheists as well. They may need it for the time being, because it serves them well, but they will face a grave disappointment when they, too, need the true presence of the Church. Today there is a general tendency to view a secular Church as more useful for modern social needs. There is also a growing tendency to adjust sermons and Church teaching to these social needs, the needs of a society functioning in anthropocentric ways, because we fear society's rejection. Protestants and, generally, the Western "churches" have succumbed to this temptation, and that is why they have spread much despair to those seeking therapy, to those seeking the true Church for a cure. Overall, a Church that crucifies instead of being crucified, that experiences worldly glory instead of the glory of the Cross, a Church that falls to, instead of overcoming Christ's three temptations in the desert, is a secularized church. Such a Church is destined to accommodate a fallen society and to encourage it to remain in its fallen state, it spreads disappointment and despair to those who seek something deeper and more substantive.